About six inches long. Rich azure blue head, neck, back, rump and tail. Reddish brown breast, flanks and a purplish chestnut patch on the upper back. Grayish blue belly. Black bill and eyes. 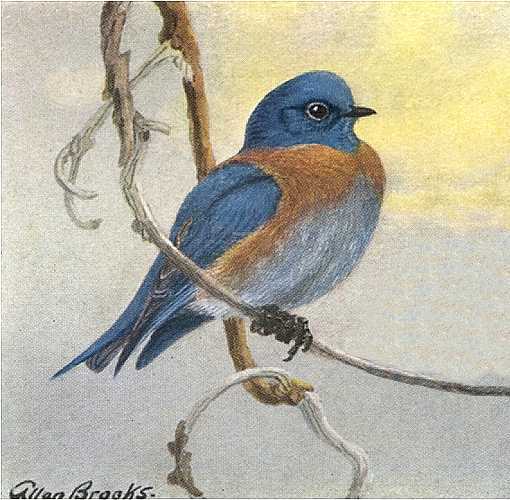 Western bluebirds inhabit forest edges, groves and small tree stands, open country, farms and towns in western North America in the Rocky Mountains from British Columbia, all along the Pacific Coast and the arid Southwest, to southern Mexico, overlapping the mountain bluebird range. Forages for beetles, spiders, caterpillars and grasshoppers. They also eat berries and other odd fruit. Builds nests of sticks, grass, rubbish and feathers in natural or abandoned tree and post hollows, abandoned mud nests of cliff swallows, between tree trunks and their loose bark, barns, cabins and odd building nooks and crannies and birdhouses. Lays four to six bluish white eggs which hatch after about two weeks incubation and young leave the nest in about another three weeks. The Western Bluebird Birdhouse (same as for the mountain bluebird), has a 5″ by 5″ floor, 12″ inside floor to ceiling and a 1 9/16″ diameter entrance hole located 10″ above the floor and ventilation openings.